Today we're taking Talking Tiny Toys back to 2006. 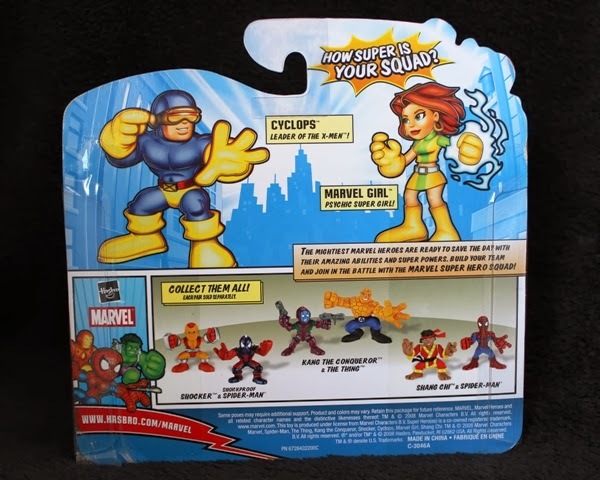 The Super Hero Squad line started in 2006 and immediately caught my attention. I'm a sucker for stylized figures and ended up buying 3 out of 4 sets of wave #1. They happened to be X-men, which made my decision that much easier. Flash forward to 2008 and these cartoonish, child friendly toys (the recommended age is 3+) are already in their 11th wave and have covered characters from most of Marvel's properties. Today we're taking a look at Cyclops and Marvel Girl (Rachel Summers). 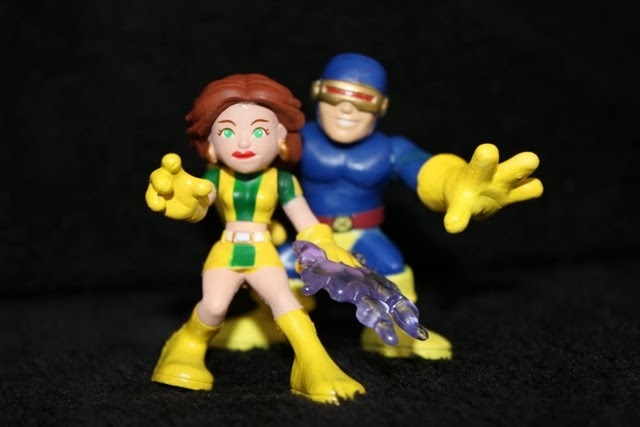 Now, I'm a huge X-men fan and you'll probably get sick of the number of mutants covered on this blog, but I will admit that these two characters are not my favourites. 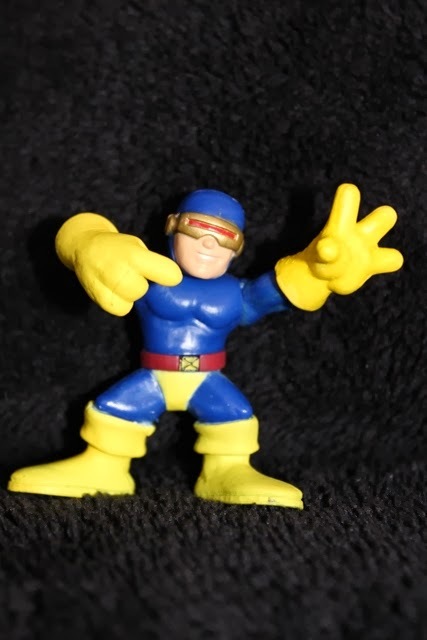 Cyclops has never really held my interest. I'm not anti-Cyclops by any means. There have been (and currently are) interesting stories told about him. 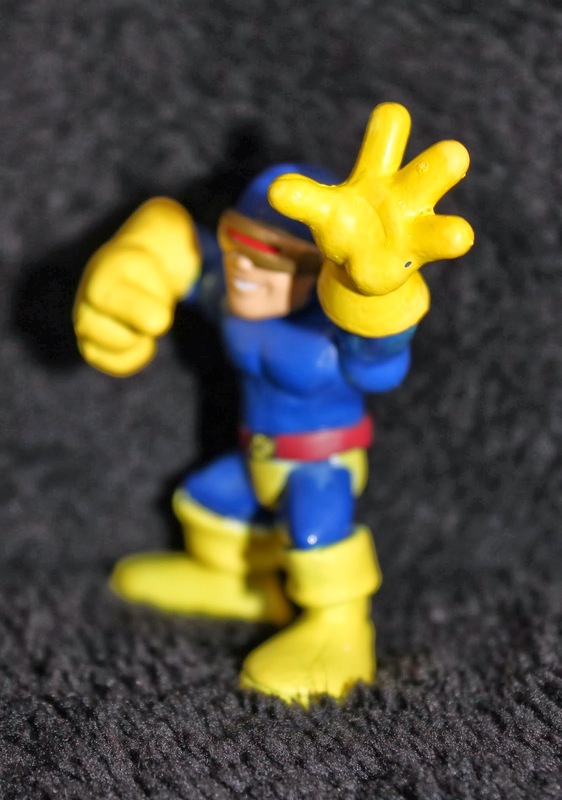 He's a staple to the X-men roster. He's just not a character I would go out of my way to find toys of. Granted, I probably half half a dozen or more Cyclops' (Cyclopses? Cyclopsi?) in my collection but that just kind of...happened. 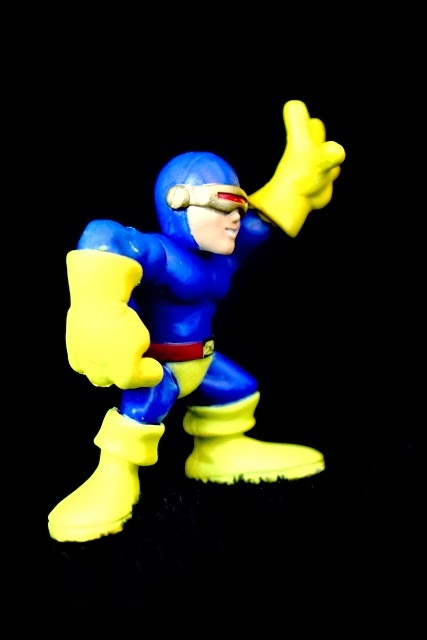 Here we see Cyclops in his iconic blue and yellow costume, complete with red belt and x-symbol. I'll always associate the character with this outfit. Everything thing else seems out of place to me. Super Hero Squad exaggerates the proportions but never loses what makes a character iconic. The over-sized hands and feet have great molded detail. 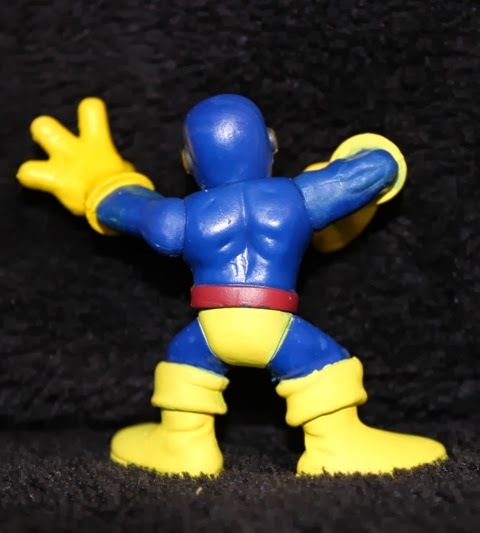 The muscular definition on both the front and back is surprising, considering the exaggerated sculpt, but is nice to see. The visor is well painted with a bright strip of red. The neck, waist, and arm joints are loose and move freely, which is nice. 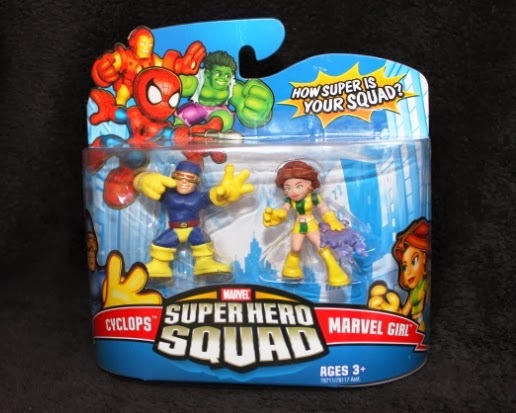 Super Hero Squad figures have very limited articulation. Even when they are designed to move the paint usually limits them (as we'll see in Marvel Girl). The best part of Super Hero Squad figures are their expressive (and sometimes ridiculous) facial sculpts. Grim, brooding character? Not here! Even Galactus has a great big grin. 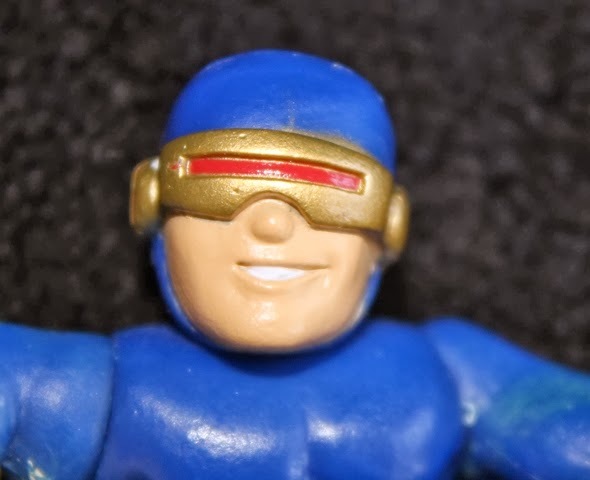 Cyclops is wearing a simple little smirk. For once, the leader of the X-men is happy. 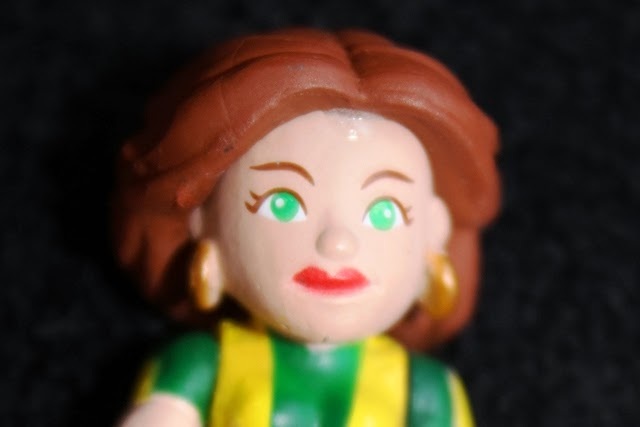 Marvel Girl has bright, expressive, green eyes, highlighted by brown lashes. Her hair is a reddish-brown and has a nice shape. She wears gold hoop earrings, and although an interesting detail, the painting of them makes them look a little strange. Her lips are a very bright red and a tad off centre. Like most of the female figures, she has a generic smile. I bought this set because of Marvel Girl. I'm not a huge fan of the character, but I really love her costume. The yellow and green shirt/skirt combination is cute and works well with the thigh high boots. The colours are great, the striping draws the eye, and the simple white and gold belt ties it together. Her psychic powers are represented by a transparent purple wave on her left hand. Her arms are quite stiff but with a little work they can move up and down. She's missing the articulation in the neck and waist. She is also slightly off balanced and has a difficult time standing up. She's still adorable though! This father/daughter (sort of) duo is a good addition to my shelf and fills a Rachel Summers sized hole in my collection. Age suggestions be damned! 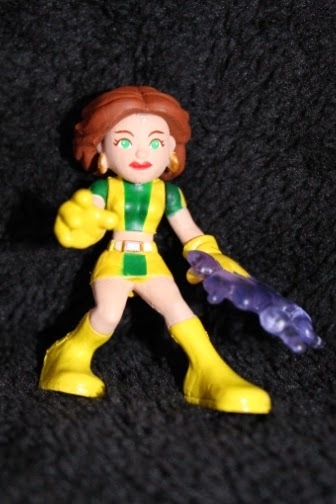 It's honestly such a great thing when Marvel's women make it into toy lines. Super Hero Squad was obviously skewered towards a young audience and this is typically where heroines are most ignored. I'm reminded of the plethora of colouring books that lack pages with Black Widow or Storm while they have five dedicated to Spider-Man, or sticker sets that have the Hulk in five different poses while the Wasp doesn't even get to have one. That's why I'm impressed that Rachel even got a figure in this line. I have to agree with you that they did a decent job with her here, especially since they even gave her a little accessory to display her powers (even though the nerd in me is screaming out that her powers were orange/red with this costume). Speaking of, damn do I ever love this look. What's odd here is that Cyke is given such a classic costume, which contrasts the modern one Rachel is sporting. It almost makes me wish they'd packed him with Jean Grey in her cute green "graduation" dress. He looks snazzy though. It's great that they went with a gold paint for his visor and I'm loving that smirk. You know, he doesn't smile nearly enough. He went through a period there (i.e. Matt Fraction's run) where he was all smiley, now we're back to sullen Scott. Oy! 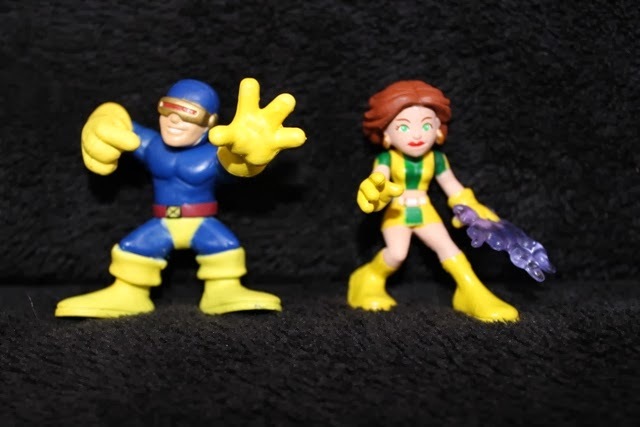 I think by the time this set came out there were already 2 cyclops figures released so the classic costume was the gimmick. Would have definitely made more sense to go with Jean, but when have they ever packaged the most logical figure together? There were actually quite a few women in this line...and ones you don't usually see. Emma, Scarlet Witch, Polaris... I have a Psylocke for god's sake! I love these stupid things so much.